A true retro classic, the Saarinen Tulip Round Marble Dining Table by Inmod boasts a luxurious thick marble top and a sleek cast aluminum pedestal base in your choice of stocked or special order combinations. This table is a gorgeous and equally affordable option to update up your dining space. Arabescato Marble is a natural stone that features a pale light gray background with accents of darker gray veining and white geometric patches. The table arrived 15 weeks after delivery. The wait was worth it and the delivery company that carefully unpacked and set up the table was great. The marble top is magnificent and exceeds expectations. The base is beautiful, stylish and well made. The base anchoring to the top is an impressive design creating a firm fit, the marble is not going anywhere. Not even a small blemish on any piece. The 55" top is perfect for us, generous for 4 settings and easily handles 6 to 8. Even though there were dealays, inMod kept us informed. I would recommend this table and company without hesitation. This table is a beautiful piece of functional art! ProsPacking material impressive, the marble top comes in wooden box design to assure the top is w/o damage. Set up easy. Marble top eloquent/stunning, base beautiful. Top is solid on the base. High quality look and feel. Lots of leg room. Lots of room on the 55" top. inmod was good to work with and kept us informed of delays. ConsIf not in stock, there may be a delay, in our case 15 weeks. outstanding in quality and design, marble top is thick and gorgeous, i thought it would be too top heavy with the base, but the base seems like its made strong and sturdy, this is a remarkable table, i strongly recommend it! I went for a round table design because I thought it would be a better fit for my family, everyone is sort of on the fence about it as far as table space but we can all agree it looks stunning and amped up the modern look of our dining room, i think everyone just needs to get used to it! everything i could have asked for! Wonderful design and well-made! Table just arrived! It looks amazing and super sturdy! The table came in three parts, base, connector and marble top. Everything was packaged very securely, no problems/dents. Seven screws total and the piece is completely put together. The table is high quality, good marble top, high quality. The underside has a weird treatment to keep the marble all in one piece I think. You'll never notice it unless you put your fingers under the table. Not sure if that's true on the original, but this is $2000 cheaper for the 40". Great purchase overall... happy with it. I got the black granite with black base and to say it's gorgeous is an understatement. Thanks Inmod!! ProsMarble is strong and so is the base. Black on black looks fantastic. I have to admit I was a little skeptical and surprised by the long 12 week wait when I put the order through. But gosh I don't regret it! The material (including the beautiful marble) is impeccable and of such high standard, I could barely believe it. I just finished furnishing a brand new flat from scratch and this is one of the best buy I have made.. I don't consider myself easily impressed but this is a real thumb up to Inmod. ProsI was also very pleased with the Inmod team, who are always available and very responsive, either over email or via the web IM system. I had been researching tables like this and was undecided until I came across Inmod. The price was great and when it was finally delivered, I was very glad I had waited and did my homework. Sturdy, gorgeous marble, sturdy base. ProsGreat price and great table. Love the veining in the marble. Would this be suitable for outdoors? 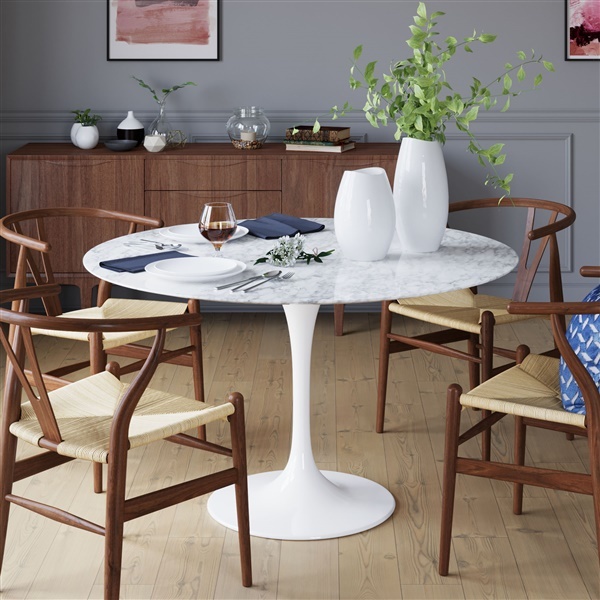 The Saarinen Tulip Round Marble Dining Table is rated for indoor use only. How is it recommended one clean the surface? We recommend cleaning up any spots and spills promptly with a mild soap and damp cloth. Are you able to tell me from where the arabescato marble is sourced? Thank you! The Arabescato Marble is sourced from Italy. Is the marble beveled on the underside near the edge? What is the diameter of the plate that attaches to the marble and base? The marble does have beveled edges. The diameter of the plate that attaches the top to the base is 31.5 inches. Is the marble top on this table sealed or unsealed? Yes, the marble is sealed on this table. You still have to handle this table with care as it is real marble and real marble is a porous material. The 36-inch and 40-inch sized tables could comfortably seat 4 chairs. The 48-inch table can accommodate 6 chairs, but it might be a tight fit, depending on the chair used. The 54-inch table can comfortably seat 6 chairs. Can you please tell me the manner by which the table top attaches to the base? E.g,, One large center screw or multiple screws. Thank you! There are 4 holes in the base that connect to a plate which then connects to the table top. 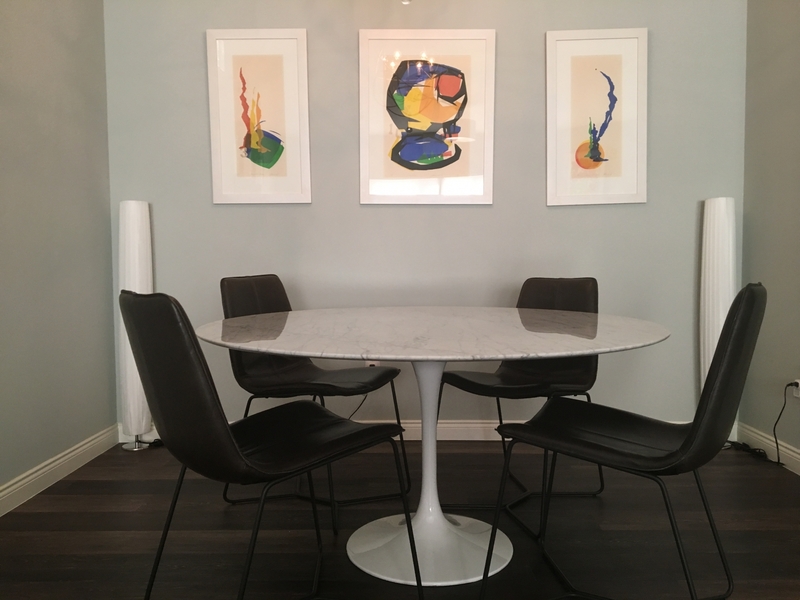 is the marble top for Saarinen Dining Table available in honed finish rather than polished? Unfortunately our reproduction of the Saarinen Dining Table is not available in a honed finish.